Sugarlane Designs: I have a confession to make..
Who would pass up a cosy dinner out? Not me! Love your stitchery. It's still friday somewhere so that's fine... we did miss you ????? Oh good for you. One stitch counts doesn't it??? Your blocks look gorgeous love that chocolate fabric you have used for the borders. that sure sounds like a delicious dinner. Gorgeous little stitches there, love the sashing. Glad you had a great evening. Love your project...great stitching, looking forward to seeing a photo of it all together...eye candy. What a lovely dinner! And to get in three stitches before falling asleep counts. Besides, you did the important part by setting up the linky earlier. And now we know what your DH looks like! LOL! Thank you very much for hosting last night - Don,t blame you for being unable to resist a meal out! Looks like you made up for it today though - lovely work, it will be great to see it finished. Never pass up a chance to go out to dinner with your hubby AND avoid the kitchen!! Love your stitchery. I made some progress on my blocks but didn't get them all finished. More work today. 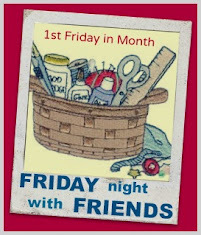 Yes a dinner out with hubby, is a perfectly good reason not to be sewing on a Friday night. Your dessert sounded delish. A dinner out sounds wonderful! Your quilt is looking wonderful too, beautiful stitching. Well I think I would have chosen dinner too. I have all those stitcheries but howavn't done anything with them - you've inspired me - maybe sometime soon. Your stitchery is very cute! Although it is fun to stitch along with others, family is a priority...so glad you have a nice time. Wendy you can stitch anytime, but when you're offered dinner out, GRAB IT. Love your blocks, oh they look so wonderful!!!! What a fabulous stitchery. I love the kitchen sink packed on the camel. You dinner out sounds wonderful. I love this pattern - but cannot get the first block anywhere. Does anyone know where I can purchase a copy of this. This would be a perfect wall hanging for my office - I'm a church secretary.